Spacious Lakeshore Home with Fire Pit & Walk to Douglas Beach! Walk to Lake Michigan (Douglas Beach is just .2 miles away!) or switch gears and bike to downtown Saugatuck or Douglas. It’s easy to make the most of a West Michigan vacation when you stay at Switching Gears. 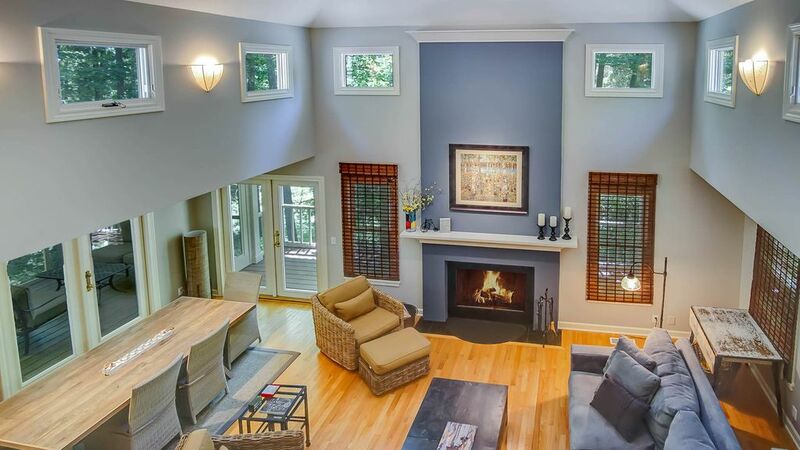 This bright and spacious vacation rental is great for family and friends gatherings. Prepare meals in the spacious kitchen, and then choose from any one of the scenic dining places throughout the house. The screened porch is a great spot to pair your morning coffee with some fresh Michigan air. Kids will love the play area in the finished basement and roasting s’mores around the firepit in the backyard. With proximity to both the beach and in-town activities, guests of Switching Gears really get the best of both worlds. Lake-shore Lodging has been West Michigan's premiere vacation rental business since 1999. With a portfolio of over 60 beautiful homes in the area--we are sure to have the perfect home for you! This upscale, 4 bedroom, 3 bathroom home has recently been remodeled and is only a 5 minute walk to the beach! Well maintained house. Especially loved screened porch. Beautiful property in premium location. Calm, relaxing spots all over house with plenty of room for big families. Kids friendly and fantastic patio and screened porch for outside time. 5 minute walk to douglas beach! We were looking for a last minute rental along the lakeshore in Saugatuck/Douglas area and had inquired on a house via the website. That one ended up not working out, but Ashley sent me additional properties that fit my criteria and this house was perfect for our families' needs. It's just two blocks to the beach and sits in a quiet neighborhood. We had three floors to sprawl out and the screened porch was a welcomed bonus. We spent a good portion of the rainy days on the porch. Everything else in the house was clean and well-maintained, and gave us some good ideas for the design of our new home. The check-in/out process was super easy and I will definitely book again with lakeshore lodging. We are happy to work with groups looking for last minute accommodations. Luckily this great home happened to be available for this family to enjoy as it is typically booked all summer! Had a pleasant family stay..... child-friendly--grandkids loved the swing and roasting marshmallows in the fire pit. Very clean and well equipped.